The once and future king of late night closes out live tour in New York. Conan O’Brien’s “Legally Prohibited From Being Funny on Television” tour, seen June 1 at Radio City Music Hall, played like an extended and remixed version of his “Late Night” show, including one of everything he might have had on a typical episode, including a musical guest and a stand-up comedian, just omitting the interviews. Most of the highlights of the performance depended on audience favorites from O’Brien’s “Late Night” material, namely Triumph the Insult Comic Dog (seen on video) and his “Walker, Texas Ranger” bit. The show opened and closed with grand musical flourishes featuring O’Brien’s band members in the beginning, strolling out into the audience in a long horn section-dominated jam. Toward the end, O’Brien himself did his own version of this during a rendition of “Take A Load Off Annie,” walking all the way up the aisle and climbing into the second mezzanine, then along stairs that ran down the theater walls back to the stage. For most of the early part of the show, O’Brien settled into a monologue – not about news stories or the usual fodder – but filled with wry asides about his Tonight Show misadventure at the hands of NBC, even a brief mockery of Jay Leno’s shrill voice. One of the most effective bits of comedy of the night that were Conan’s doing alone were a video of himself, hair slicked back and bespectacled, playing a nasty, snarling network executive who squeezes the cat he’d been stroking like a Bond villain, just a little too hard. But it was the guest turns that really raised the level of the comedy in the show, namely an appearance by Stephen Colbert and Jon Stewart (who probably were not present at other tour stops). Colbert came on first to joust verbally with O’Brien, then challenge him to a goofy dance-off during which Stewart suddenly appeared from the audience in something like a caballero outfit. Also contributing, in very small appearances, were Bill Hader, John Krasinski and Paul Rudd, who each took turns engaging in brief banter with their host before pulling the lever prop that called up the most ridiculous “Walker Texas Ranger” clips Conan’s producers had found. The only quibble with the show Conan has put together for this road outing that is serving to keep him fresh in people’s minds for his return to TV this fall is that it’s a little heavy on O’Brien performing cover tunes, which he does serviceably but not astoundingly. But some absurdity gets thrown in to leaven even this, namely in the form of a giant blow-up bat that supposedly came from a Meat Loaf tour. And at times, even O’Brien’s rock-star jones can pay off, as in an energetic rendition of Elvis’ concert staple “Polk Salad Annie” and the disco hit “I Will Survive.” Judging by the improvised banter with audience members that O’Brien also fit into the show, which gave the night unique touches, he will indeed survive. 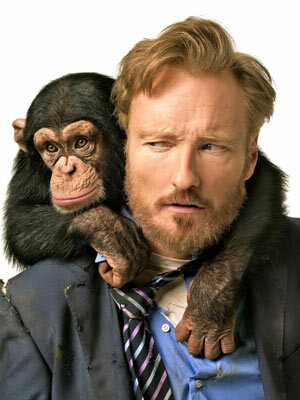 Conan O’Brien’s “Legally Prohibited From Being Funny on Television” returns for the final night of the tour June 2 at Radio City Music Hall in New York.